View of “Lior Shvil: PROTOCOLS,” 2015. I FIRST LEARNED OF TWENTYNINE PALMS, a city in Southern California that houses a vast Marine Corps Air Ground Combat Center, in 2011 when I went to shoot a video in nearby Joshua Tree. The base holds incredible training facilities, including seven mock city districts for urban combat that simulate Afghan villages. I am familiar with similar facilities from my own experience in the Israeli army, but what caught my attention and astonished me is the fact that at other bases the US army hires Iraqi civilians who fled their country to play the role of villagers while soldiers train—including at a nearby center in Fort Irwin, California. Since then, I’ve been investigating different counterinsurgency theories and strategies that are at the base of these training exercises. Counterinsurgency Operations (also known as COIN) are defined by the 2009 US Government Counterinsurgency Guide as political strategies designed to protect the population from insurgent violence and to strengthen the capacity of governments. The guide functions as a manual for the army and contains detailed protocols for soldiers serving in the field. These describe how a soldier should perform with “minimum damage” while conducting various procedures, such as a “Search and Control” exercise, which refers to what the soldier should say and do if he stumbles upon villagers. What I found truly amazing was how these protocols are often racist and devoid of humanity, while they also are detailed instructions for forceful violent actions. As an artist and former architect, I explore a range of visual languages and base my work on different storytelling forms. For this show, I chose to reread the guide as a poetic text in order to stage a scene that I could experiment with and observe. The text becomes a subversive tool that allows me to reactivate it with new psychological meaning. Early in the project, which I initially conceived and realized as PROTOCOL X at High Desert Test Sites in May 2015, I began collaborating with actress and improv director Hollis Witherspoon, who has been my improv instructor for the past year and a half. Hollis adds an important layer to the work: While I am looking at the project from a sculptural point of view, Hollis adds an experienced theatrical perspective. I’m using nonprofessional performers, and the cast changes from one presentation to another, so do the scripts and actions. This is why I refer to the performances as “exercises.” For the exercises in “PROTOCOLS,” I sampled some of the archetypes the guide introduces: an old man with a stroller; a preacher or leader; a hysterical woman; a widow; and an orphan. Each of these characters represents a code for particular army maneuvers and routines. In addition to these villagers, a few of the participants play the role of US Army soldiers, thus simulating a real life encounter. 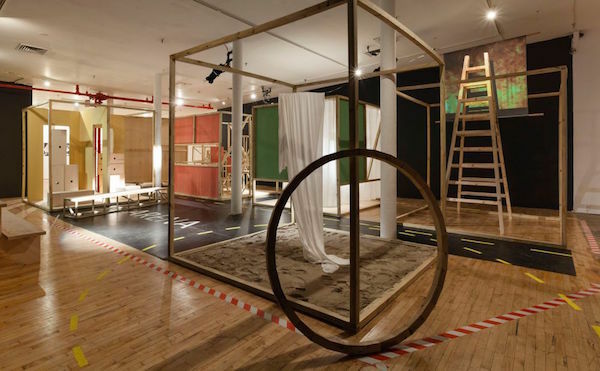 The installation at Art in General is based on a 1950s UN proposal scheme for Palestinian refugee camps—a model that consists of an endless grid of eight-foot-square cubicles that house displaced families. These cubicles become theatrical units that accommodate the different characters. The participants decide how they will portray the characters and what their actions will be within the defined protocols. In the work of Augusto Boal, to whom I owe a lot of this open-ended approach, he eliminates the audience by giving them active parts in the play. Inspired by his work, I introduce questions to the audience during the exercise, which enables them to make decisions regarding the development of the performance. The audience, referred to as “Public Opinion” in the show, may choose to take the side of the villagers by defending them from the soldiers, or may choose to support the soldiers. For example, the audience might be asked to actively assist in physically detaining a suspect. They will do so if they feel there is enough evidence to take this person into custody for further debriefing. Their decision is based on what they have witnessed in the chain of events in the performance up to that point. By giving their response, they can drastically change the course of action, right up to the end of the performance, and may feel responsible for the consequences.